Summer Fun All Year Round! 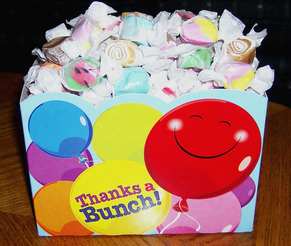 All packages sent with mixed flavors of taffy. If you want a specific mix, just email us after you place your order at Dennis@BalboaTaffy.com and we will make sure the right mix gets in the order. chocolate taffy, caramel swirl taffy, peppermint taffy, licorice taffy, banana taffy, butter rum taffy, vanilla taffy, watermelon taffy, caramel apple pop taffy, banana strawberry taffy, cinnamon taffy, Neapolitan taffy, blue raspberry taffy, orange cream taffy, root beer taffy. 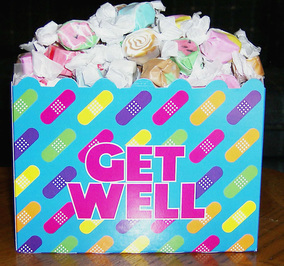 Other flavors available upon request Salt water taffy makes for a fun gift. 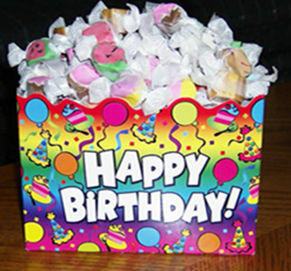 You can give it for birthday, corporate gift, anniversary, real estate gift ( real estate agents always seem to need to thank someone), business gift, a thank you gift, college survival package, home warming gift, homecoming gift, Christmas, new years, add to a gift basket, administrative assistant's day, boss gift, summer gift, or any house warming gift. We will even add laffy taffy and Abba Zabba to any gift basket for a wider variety. 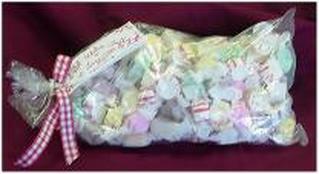 We also have sugar free taffy available upon request. In your online search you may find more products under taffee, tafy, tafffy, English Toffee or toffee.